No, I am not having a mid-life crisis. However, I may be having an existential one. I just came to an interesting realization. We've missed the boat and it's taking the young minds of the 21st century with it. What am I talking about? Social Media. Even those of us who claim to be on the bleeding edge of technology in the 21st century and shout from the mountaintops that we need to use technology as an essential tool to engage students are missing something. And my issue is that the "something" we are missing may never be able attainable, unless we start to change our mindsets. Somewhere along the line, we lost our path. We are so busy asking students to "turn off" in order to "tune in" that they are shutting educators out completely. And where where are they turning instead? Celebrity. Big deal, right? But what do you notice here? When was the last time you saw an educational "rockstar" that you admire get 69,324 likes, 3,829 comments and 1,275 shares in the span of 16 minutes? She has their attention! Now, I'm not suggesting that we don't respect each other within our community. We do. But we are not tapping the power of Social Media effectively. Too many of us within the educational technology community (myself included) haven't figured out how to really connect. And instead of trying to figure out why that is, many have chosen to abandon tools that point these facts out. 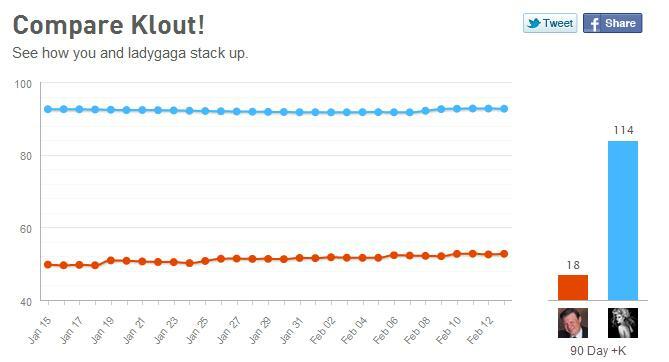 Take Klout.com as an example. If you are unfamiliar, this is a tool that can effectively help you analyze your social influence. When they changed their algorithms a few months back, to give a clearer picture of the use of social media, a number of educators scores dropped. Instead of asking why, the tool was denounced as lacking in value. I constantly hear that we need to break down the four walls of the classroom or school. But are we really making the effort? Compare the reach of some of the top influences in education to that of your favorite celebrity on Klout and I think you'll find just how out of touch we are, even with each other. 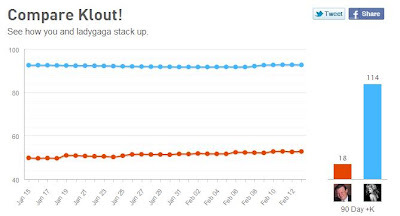 I'm not ashamed to admit that Gaga overpowers my reach as you can see from the chart below. What I am trying to understand is why? And it has to start with us. I'm not suggesting you participate in social media with your students (this is still too slippery a slope). However, you should be more engaged with your peers. When something strikes you within a post on Twitter, Facebook, Google Plus, LinkedIn or any other network - share it! If something gets you thinking - reflect, digest and post it! If we build a solid foundation with a network of global educators there's no telling what tomorrow might bring. We need to find the "it" factor among us.